Elon Musk is clearly looking towards a future where those purchasing and consuming his products feel at one with mother nature’s greatest asset; the sun. After introducing innovative roof tiles with photovoltaic cells baked in for homes, Tesla has now introduced an upgrade option to the already stunning Model S sedan that will allow owners to become one with the environment thanks to a beautiful all-glass roof that removes the boundaries between machine and nature. The new option is a $1,500 upgrade that will force would-be Tesla Model S owners to choose between this new all-glass roof option and the existing $2,000 panoramic roof option that still looks undeniably beautiful, but comes with a middle crossbar for support purposes. Opting to pay the required $1,500 removes that middle cross bar and introduces an open solution that not only gives a view of the world above, but also introduces a Tesla recommended open, expansive feel to the cabin when the owner is sitting inside the vehicle. There’s an immediate concern that all of the glass will mean that the interior of the vehicle could instantly become a collection of heat that would make it an extremely uncomfortable place to be in. Tesla is keen to point out that that’s simply not the case with a tinted glass installation that performs extremely well to block 98-percent of the sun’s ultra violet rays, as well as deflecting approximately 81-percent of the heat that beats down onto the roof. And of course, with the Model S being a Tesla, there’s also the option to remotely turn on the air conditioning on those hot days before actually getting into the vehicle. While Tesla says that “sky’s the limit”, with the new all-glass option offering an “incredible view” for those inside of the car, still, it definitely won’t appeal to all, and definitely won’t be an option for everyone. 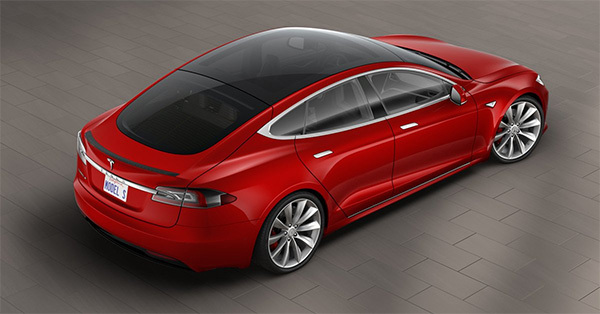 Anyone who needs a Model S that can be fitted with a roof rack, or who wants satellite radio, will still need to opt for the panoramic roof option. Meanwhile Tesla has also quietly done away with the Ludicrous Mode on the regular Model S. It is now available only on the top-of-the-line P100D model. Giveth with one hand and taketh from the other? Pretty much.